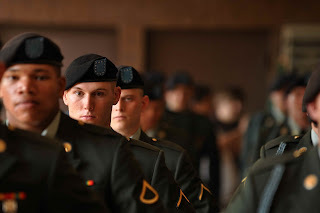 Turning Blue is the ceremony in which a soldier becomes an infantry man. This ceremony is where the soldier receives his blue chord. The blue chord identifies the infantry soldier. It was a very powerful and moving moment. I am so proud of Justin and his accomplishments. He has chosen a difficult path. But it really makes sense for him. I am humbled that he asked me to pin his chord on him. What an amazing moment that I will never forget.